Criticism of the poll because of its obvious bias from both Bryant and Hilleary is warranted. Bryant's call for Hilleary to drop out of the race wreaked of desperation, however, and as a Bryant supporter, I don't like my candidate looking desperate. I do not believe these numbers are accurate, just as I did not believe the Survey USA poll of last week. However, I don't think that there is any doubt that Corker holds a statistical lead at this point in the race. Unlike some people, I do not believe Corker's lead has all to do with money. It does have to do with the fact that as of today, neither the Bryant campaign nor the Hilleary campaign are doing the simple things that they can do to increase their campaign profile, and they do have the resources to do these things. I think nearly everyone in East Tennessee with a television set has seen one of Bob Corker's commercials. As effective as commercials are, I don't think they have as much of an impact as the huge Bob Corker signs outside Pilot stations all over the region. Yes, I know Jim Haslam had them put there-but if you drive around Knoxville for any length of time, you are beginning to see Corker signs wherever there is an open patch of grass. They are still usually not far from a Pilot station, but I have seen them in open fields-I even caught one in East Knox County at the edge of a patch of grass near a Food City. These signs are now no longer just the province of Pilot, they are beginning to crop up all over Knoxville. Where are the Bryant signs? Where are the Hilleary signs? Van Hilleary did have a brief ad buy here, but he has disappeared. Bryant is nowhere to be heard or seen by the everyday potential voter. I have not been approached by either campaign to put up signs for them, and I think it says much for the state of both the Bryant and the Hilleary campaigns that their campaigns in East Tennessee are virtually non-existent, especially in Knoxville. I know that Ed Bryant is coming to Knoxville for a major fund-raiser. I am glad he is coming, and I hope he raises a ton of money. I'd love to be there, but to be honest, since I am about (by hook or by crook) to buy a house, I don't have $250 right now to lay down so that Nicole and I can attend. More folks need to see and hear Ed Bryant than just the people who can attend the fundraiser-though I hope that many people do attend, the campaign needs the money to get the message out there. 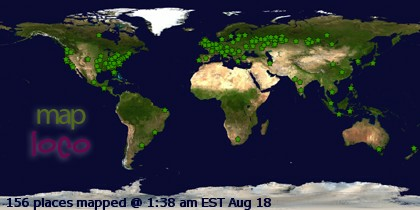 However, this is a bit late in coming. Ed Bryant should have been making several trips to Knoxville and let the press know he was coming, and he should have done it long before now. Van Hilleary is also nowhere to be found in this area. On talk radio, yes-but we all know that for the most part, die-hards listen to The Voice. I met Van on Primary night, but beyond that, I have heard little out of him except on local radio. It isn't as though Corker doesn't have problems. The entire blogosphere now knows (thank you Terry Frank) about the Bott radio network countering Corker's ads with spots that followed detailing Corker's real record. As a result, Corker has abandoned Christian radio altogether-that could be a critical campaign problem since people who listen to such stations are often Republican voters. What's more, in a dramatic turn-around Corker has agreed to participate in the Town Hall Truth Forums. We will get to see how Corker responds to the very legitimate criticisms of his record, and if he will be willing to do it more than once. If Corker is to be beaten, his opponents need to establish a constant presence in East Tennessee, and they needed to have done it months ago. This race will be won or lost in East Tennessee, and it is time the conservative candidates began to recognize that reality. I am a bit late in doing it, but I have added Knoxville News-Sentinel political reporter and fellow blogger Michael Silence to the list. I think Michael is probably the most fair and decent reporter at KNS. I want to thank him for agreeing to be added to my blogroll. There are times that I wish Silence were the editor-in-chief over on Western Avenue. If he were, I might actually subscribe to the paper. Since Michael recently underwent bypass surgery and is still recovering, I extend my prayers as well as any help with his blog that my vastly inferior writing skills might be able to render-God Bless and Godspeed, Michael! 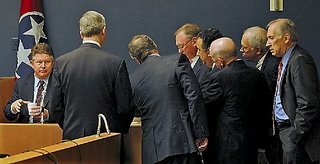 The latest in Knox County's continuing election saga came in Knox County Chancery Court yesterday when Knox County Administrator of Elections Greg Mackay said yesterday that he could not find the Secretary of State's approval of the Charter, or any proof that the 1988 referendum results on the Charter were ever sent to the proper State authorities. I have written that regardless of whether or not you feel the five Commissioners suing in this case are simply trying to get around term limits (and I don't think there is any question that they are), the basic legal question in this case, namely "is the Knox County Charter valid," is very much a legitimate question. I dearly wish the question had come up in a different case under very different circumstances, because this case simply takes a very serious constitutional question (validity of the County Charter) and makes it into posturing over ballot position. That is a shame because, as I have said, based on my reading of the Charter and understanding of Tennessee law (disclaimer:I am not an attorney) I do not believe the Knox County Charter is a constitutionally valid or legally binding document in its present form. Hence, regardless of how you may or may not feel about term limits, the right decision for Chancellor Weaver to make is to throw out the Charter. We need a new Charter if we want to do Charter government right. I strongly suspect that a term-limits amendment to a new and valid Charter would survive another ballot test. Knox County Election Administrator Greg Mackay , far left, watches from the witness stand as attorneys gather around to examine a document Thursday in Knox County Chancery Court. Well, bad news on our offer for the house we love in Cocke County. Our real estate agent was told by their real estate agent yesterday that our offer was rejected. This in spite of the fact that our offer essentially gave these folks what they were asking for the house. We have good credit and the financing and payment had all been arranged, none of that was going to be a problem. Obviously we smell a rat, and so does our agent. He strongly suspects that their agent never showed the sellers our offer, so he is going to try and force her hand by making her present us with the signed forms showing our offer was reviewed by the sellers and rejected-complete with the date of the rejection. However, even if we got hosed on this house, there is little we can do outside of an ethical complaint against the sellers' agent if the other offer has already been accepted. Back to square one on the house hunt. We do need prayer. Yesterday, Nicole and I took our customary annual trip to Dollywood. En route, I noticed something that seems to get worse and worse with each passing day. The amount of smog and dirty air that one is forced to breathe when a person goes up to Pigeon Forge, Gatlinburg, and the National Park is outragious. The smoke you see now is not the natural steam rising off of the mountains, but the smoke rising from millions of motor vehicles coming into the towns and the park that we have collectively turned into tourist traps. I am not suggesting that we reject tourism as a viable industry in East Tennessee. It is an established fact that prior to the birth of the tourist industry, Sevier County was among Tennessee's poorest counties. Sevierville, Gatlinburg, and Pigeon Forge are a living testimony for what creative business people and a beautiful natural setting can do for a local economy. We do not need a "Yankee go home" mentality-I don't know about you, but I want those outside dollars coming in, they help keep our taxes low. Even so, coming here as a visitor is one thing, but living in East Tennessee is quite another. When you visit, you don't tend to think about the harm that all those extra cars and all of those extra people and all of that suddenly-occupied space is doing to the mountains that so many of those folks are coming here to see. When you are here and you can smell the air, breathe it, and even see it, and you have to deal with the traffic congestion near one of the world's most beautiful mountain ranges, it strikes the conscientious person that something needs to be done about it. I'm not saying this as though I am some Greenpeace radical-on the contrary, I tend to eschew the notion that human beings are the cause of all of the world's environmental evils, an idea that many liberals embrace. However, it can't be denied that the sheer number of people visiting the mountains and leaving a trail behind when they leave has a negative impact on the place, so much so that organizations exist whose sole purpose is to preserve the beauty of the Smokies from fading away. I am not sure what the answer is, because the community needs those tourist dollars, but is there a way to have the visitors and preserve the mountains at the same time? If the mountains can be said to "belong" to anyone, they first belong to the people who live in this part of the country, and it is our responsibility to preserve this beautiful natural heritage for future generations. We need to find a way to balance our economic needs with the preservation of the Smokies themselves. Yesterday Nicole and I made an offer on a house. It is a one-story ranch-style dwelling with a large two car garage with multiple storage space. There is enough space in the garage alone for a huge amount of storage. The house needs a little work, but not much-mostly renovation of the bathroom, installation of some new appliances, and the building of a deck to make the entryway level to make it easy for me to enter and leave the house. Things tend to turn out as they are supposed to. When I dropped out of the Knox County Commission race, I said that the primary reason I was doing so was that we as a family really needed to get some property of our own and begin to look after our business interests before I could run for office. If this offer is accepted, our new home will be on North Street in Newport in Cocke County. Acceptance of the offer isn't a sure thing at this point-we made a good offer, but we found out as the paperwork was being faxed that someone else made an offer on the property within the hour. We have to hope and pray our offer is accepted, while the other is rejected. As for politics, this hardly puts a damper on me being involved in politics, it just means I'll have to start from the ground up. I'll be involved and active in GOP affairs, and I'll try to begin my involvement from day one. I think it is important to show by your actions that your community, whether you have lived there all your life or whether you are new to it, matters to you-and you are willing to give of your time and abilities to make it a better place. I am certainly willing to do that in Newport and Cocke County, or wherever we might make our home. Leaving Knox County is not a sure thing, though-the Knox County Dems shouldn't order the catering for the "Oatney is gone" party just yet. That offer we made might get turned down since someone else also made an offer yesterday. If the offer is rejected, we are back to square one. I will admit, though, that I like the house and the property and, for that matter, I really like the Newport community and I always have. I hope and pray that the offer we made is accepted. If we do move to Cocke County, it will certainly lead to some new political experiences to say the least. Considering my known inability to keep my mouth shut, I am certain in may lead to some serious boat-rocking. However, I would hope that in time whatever meager contributions I might be able to make to conservatism in Cocke County will be as welcomed and embraced as they have been in Knox County. Whatever will be will be, though, and we'll see what happens on that front in the coming months and years if the purchase of this property becomes a reality. The legislation that didn't pass-it "Naifeh-ed"
Rep. Chris Clem (R-Lookout Mountain) gave details of Jimmy Naifeh's filthy corruption to The Chattanoogan. The House passed what Stacey Campfield has (rightly) called the "incumbent protection bill" that makes it virtually impossible for write-in candidates to get on the ballot. This after several made it on the ballot in Knox County in Commission races in the May Primary. A.) Members were voting for other members by proxy who were not even in Nashville in a floor vote, a more than questionable parliamentary practice. B.) This practice is prohibited when the House invokes what is commonly called "The Rule." The Rule requires that all members be in their seats during votes, and can be invoked when five members of the House call for the Rule. Rep. Clem estimated that at least fifteen Representatives showed hands to invoke the rule, but Jimmy Naifeh claimed "I only see three hands." C.) Naifeh then declared the bill to have passed after several members, most of whom were Democrats, voted for other members who were not in the chamber by pushing the "vote" button in their empty seats, even after fifteen members showed hands for the Rule when Jimmy Naifeh only saw three. By all accounts, a quorum was not present in the House. Bredesen will probably sign this bill. This is the best argument for why Jimmy Naifeh needs to be removed from the Chair ever presented. After this sort of abuse, Naifeh should be removed from the House because of abuse of power if the Republicans (finally) liberate the House from Warden Naifeh in November. No members can call for this bill, designed to deprive people of ballot choices and disenfranchise them, to be reconsidered based on the improper way it was passed, because the 104th Tennessee General Assembly has adjourned sine die. To think some of you re-elect these people! I know a few of you think this is a good argument for term limits. Is it that, or is it an argument for how ignorant the "average voter" is? People who never miss an election are usually not "average voters," but are usually very well-informed. Many of these people are returned to their corruption by the votes of the "vote when I feel like it" crowd. The story I am about to relate may strike certain of my Protestant brothers and sisters with some unease, but it is a true story, and telling it will perhaps make some people better understand my position as far as the U.S. Senate race is concerned. 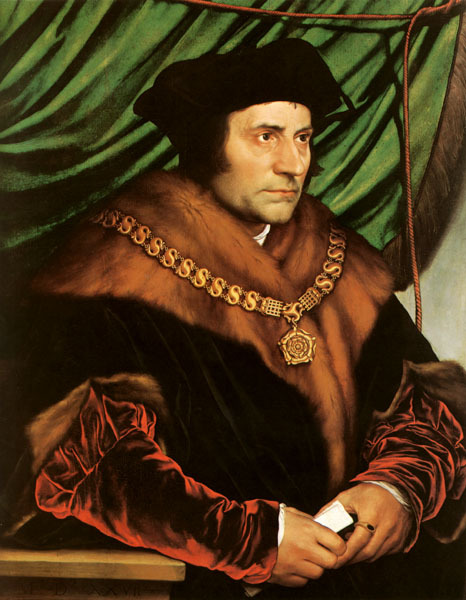 Saint Thomas More, patron of people in politics. Thomas More was a lawyer and was Lord Chancellor of England. In 1501 he was elected to Parliament, and was known to have worked tirelessly on behalf of his constituents. In 1516 he joined the foreign service at the insistance of Thomas Cardinal Wolsey, who served more or less as Henry VIII's Prime Minister until 1523. By 1529, More had become Lord Chancellor, which in those days carried the same power as a Prime Minister might have today. More, though often critical of the King as an MP, had become a friend of the King over the years. One of More's duties as Chancellor was to enforce the laws of the realm, and these laws (in those days) included laws against heresy and schism. Thomas More believed that no one was above the law of men except in the service of God, and no one was above God's law, not even the King of England. Henry deigned to declare himself as "supreme Head of the Church of England" in order that he might divorce his lawful wife Catharine of Aragon and enter into a perpetual state of adultery with Anne Bolyn. More refused to acknowledge the legitimacy of the unlawful marriage or the right of Henry to assert himself as head of the Church. In 1534 he refused to swear an oath that acknowledged Henry and Anne as the legitimate heirs to the throne and Anne as the legitimate queen. In 1535 More, while imprisoned in the Tower of London on charges of treason for refusing to accept the Act of Supremacy, stated to Lord Cromwell that he questioned the authority of Parliament to confer any of the Church's authority upon Henry. On July 1, 1534, More was tried at Westminster for treason and was found guilty. At the trial, he reminded his audience that he had done nothing but serve his King faithfully, and that he only owed to God greater reverence than the King, to whom he was justified in giving so. He also reminded the Court that Henry was not the Successor of Peter ordained by Christ. More was beheaded in the Tower of London. He was canonized a saint by Pope Pius XI in 1935, and he is the patron of politicians and attorneys. Among his last words, he said "I am the King's good servant, but God's first." More's death, along with that of St. John Fisher signalled the beginning of widespread schism and Christian division in the English-speaking world that continues to this day. I have always been a very steadfast Republican. I have been one to vote for the Republican candidate over others in a General Election even when I do not see eye to eye with that candidate, because a Republican always strikes me as superior to the alternative. I have never, however, voted for a candidate who was not pro-life, and I will never do so-regardless of Party. In our Tennessee Senate Primary, we have two pro-life candidates. There is a third candidate who tells us that he is pro-life, but his statements in the recent past tell us otherwise-he has had a "road to November" conversion. He is also a notorious tax raiser who has lied about his record and attempted, even on Knoxville talk radio, to avoid the discussion of his record in such a way that it would expose him as not being a conservative-and not even remotely so. If Ed Bryant or Van Hilleary is the Republican nominee for the United States Senate, I will do all in my small power in the fall to give assistance to either man. I will blog for them, I will pass out literature for them, and if asked I will man polls for them if need be. Most importantly, I will give my vote to either man in a General Election. I endorse Ed Bryant, but I will be happy if either wins instead of the alternative. If Bob Corker is the Republican nominee for Senate, I will give no such aid-I will write no endorsement, I will pass out no literature, I will man no polls. On Election Day, if my choice is between Bob Corker and Harold Ford, Jr., I will leave the ballot flashing-I will vote by casting no vote, because neither man is worthy of the United States Senate. I have never done such a thing before, but I will do so if left with no other choice. I cannot and will not knowingly vote for a "pro-choice" candidate, which I believe Corker to be based on his own record. I will not vote for a fraud, and I will never vote for Bob Corker. I am and will continue to be a good and loyal Republican. I am the Party's good servant-but God's first. Many of you, in addition to reading this blog, will enjoy picnics and barbecues and parties of all sorts with family and friends today. As you do so, there are some important things you ought to remember. I write this weblog nearly every day, and I write about political topics of local, state, and national interest, as well as about my faith. We live in a country where I am free to write things that are often critical of government officials and candidates for public office. You are free to read those things and publicly comment on them. There are many nations in the world where people are not free to write as I have written, and where readers are not free to read such writing and comment on it. In nations such as Iran and Red China, there is no free press, and what internet access the people have is severely limited since the government wants to filter out anything that is critical. People in North Korea don't even see press from the outside world-huge satellite blockers can be found near the DMZ to filter out any media unapproved by the state. As flawed as our local election system is in Tennessee, we enjoyed a free and fair Primary in May, we will likely participate in a similar State exercise in August, along with local elections. We will have a national General Election in November where we will elect members of the next Congress. I'd be willing to guess that if anyone questions the legitimacy of any of the upcoming votes, there will not be riots in the streets or threats of a coup d'etat. Instead, any such disputes will be settled according to the rule of law. Republican Clubs, Democrat Clubs, Conservative Unions, Common Cause-all of these kinds of groups and many others can hold public meetings and attempt to change the system of things. None of them need government approval to try and change the face of government. As often as I write of faith, in many countries, uttering the Holy Name, or worshiping God in public can make you a criminal, unless the state approves of your religion. Yet I can speak the Name, and praise the Name, and no one will haul me away to prison-although certain people do not like the Name on public property. For all of these advantages, I owe a thank you to people like my Dad who were willing to put on the uniform of their country, and to his Dad who served in the Ardennes. We all owe a thank you to the men and women who gave their lives so that we might live in a country where we could be free to be good citizens, and who are putting their lives on the line as I write this. We would also do well to remind ourselves that freedom is not free, and to truly be the best of citizens, we must all be willing to lay down our lives to protect the freedom of others. We owe remembrance to the men and women who have paid the ultimate price and made the ultimate sacrifice from the War of Independence up to the present hour in the name of their God and for the freedom of their country. So when you eat that burger and that hot dog today, remember the people who made doing so without fear a possibility. "From the rising until the setting of the sun, we will remember them." As a historian, the thought has occured to me lately that the art of statesmanship is dying in America. I'd venture to say that we haven't had many real statesmen in public life in quite some time. In Congress, I think most of the people I would consider great statesmen of both parties have retired. With the retirement of Ernest "Fritz" Hollings and the retirement and death of Strom Thurmond, Congress lost two great Southern elder statesmen of both parties. As much as I often disagree with Robert Byrd, he has proven himself over the years to qualify as a statesman. He has engaged in his share of public spending stupidity enough to qualify himself as a good Democrat, but he also was one of the lead Senators to push the Defense of Marriage Act (he was a prime sponsor of the legislation) and I recall that he brought his father's Bible to the Senate floor and quoted from the First Chapter of Genesis. In recent years, I fear that Robert Byrd's old age and senility have prevented him from functioning with effectiveness, and he is frequently given over to delusion on the Senate floor. What has caused this reflection on the loss of statesmanship is that I am currently reading David McCollough's biography of John Adams. Adams was (and remains) a model (as do many of the rest of the Founding Fathers) of everything that should define a statesman. He saw nothing wrong with political ambition, and he possessed it himself. He was a good lawyer who travelled the court circuit and he saw providing for his family through his profession to be his primary responsibility in life. Yet, in spite of this primary responsibility, he accepted election to the Massachusetts Assembly (he was chosen, as they did in those days in New England, by the town meeting) because he believed he had a duty to serve his country in public life. He entered public life writing against the Stamp Act in 1765, so we would say he began his public life as a political writer and agitator (he might have been a political columnist-or more likely a blogger, in todays world). He was first elected to the Massachusetts legislature in 1770 after a successful defense of the British regulars accused in the Boston Massacre. Adams would serve for a single one-year term. He thought he was giving up politics. After being chosen by the Massachusetts legislature to attend the First Continental Congress in 1774, Adams would never again be a private citizen until he retired from public life in March of 1797, after being defeated for a second term as President of the still-new United States by Thomas Jefferson. Even in retirement, Adams was never fully free of the public spotlight because his wisdom and experience in government were sought by many others at the State and federal level. As we look into the pantheon of great American statesmen, often lost to the present generation because this generation has utterly forgotten our history (or worse, some are ashamed of it), we see men who gave of themselves to serve. Our own William Blount and John Sevier spent virtually their entire careers in public life once necessity or decision caused them to make the leap. Daniel Webster spent nearly his entire life in public service after being elected to the House in 1812, except for a brief four-year break. John C. Calhoun, who has always been a hero of mine solely because of his "cast-iron" defense of States' rights, was first elected to the House in 1810, and until his death in 1850 he served in public life. In the House, the Senate, as Vice President, and Secretary of State, Calhoun had done it all. So long did Calhoun serve that he was wheeled into the Senate in a wheelchair in 1850 to attend what would be his final Senate session. Statesmen are people who are more concerned about the next generation as opposed to the next election. In Tennessee and in America there is a serious lack of these people. Many of my fellow Tennessee conservatives believe that the best way to insure that we get a few statesmen is to have mandatory term limits. I have great admiration and respect for many of the people who share this view, but I do not join them in this conclusion. I have seen how term-limited regimes function in other States where they are now the established law, and I find them to be a complete disaster. Rather than encourage ordinary people to enter public life and to become statesmen and stateswomen, they often merely encourage people already in government to circle into other offices and for their endorsed successors to take their places. When a bright new star emerges that could prove to be a great statesman or stateswoman, that person is often filtered out of their office by term limits, choosing to leave public life rather than seek another office where they are less comfortable or less effective. What we somehow need to do is to encourage everyday people-small business owners, ministers, farmers, factory workers, real-estate agents, country lawyers-name the profession- people from all walks of life to enter public service and do as Washington did before them, stay as long as they are needed, and then leave as they came. Our present state of affairs does not lend itself to encouraging potential statesmen to enter public life in Tennessee or the Union at-large. I am not sure what we need to do to change this situation, but we need statesmen if all we can do is pray for them.